Editor's Note: Paintings by Robert Waldo Brunelle, Jr. and Pamela Marron open Friday, November 3, in Gallery 2 at Vermont Artisan Designs, 106 Main Street. You may know Robert Brunelle as the cartoonist behind the political cartoon "Mr. Brunelle Explains It All." You may not know that this very funny guy is also a very serious painter. Brunelle says that his "wry sense of humor" sometimes "creeps in" to his paintings. But while his vibrant townscapes and scenes may evoke a knowing smile, they don't make you laugh. And though Brunelle identifies himself as a storyteller whose work captures moments in the life of the un-self-conscious "peasant class," occasionally with unabashed nostalgia, Brunelle is a far cry from Norman Rockwell. Take, for example, the large painting titled "Second Shift." A dour factory worker waits for the bus in front of a chain link fence while the sun sets on two smokestacks and their exhaust in the background. This painting could easily have become a dark political statement or a glorification of the gruff endurance of The Working Man. But Brunelle keeps his touch light -- with the subject matter, at least. Not so with the colors: this canvas shines. The sharp, dark diagonals of the fence in contrast with the holographic billows of smoke are what this painting is all about. 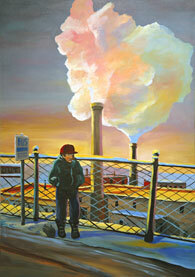 Brunelle's bold, bright acrylics steady "Second Shift" and keep it from tipping into cynicism or sentimentality. Brunelle loves the "juiced up" color he gets from acrylics. Since he stopped working with oils (and the toxic solvents they require), Brunelle has learned to paint more rapidly, mixing colors directly on the canvas. "Acrylics forced me to become a better painter," he says. They also help him turn up the volume when painting his favorite things -- "the homely institutions people don't pay much attention to," like fairs, gas stations and old-fashioned barber shops -- all subjects that feature regular people living their regular lives against a technicolor backdrop. Brunelle also has a distinctive interest in the dynamic shapes of faces. 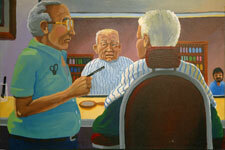 In one of Brunelle's barber shop paintings, "A Little off the Top," we see the back of the customer's head as well as his face in the mirror. The customer is saying something -- a rather unusual occurrence in a painting, where we are used to demure stares and far-off gazes, but seldom open, contorted mouths. The customer is trying to sit still; he is looking sideways at the barber and talking out of one side of his mouth. But the barber has retracted his comb and is waiting for the customer to finish. It is not obvious that the customer needs a haircut. "Barber shops are mostly about conversation," says Brunelle. "They're like bars for people who don't drink." For all his interest in faces and stories, however, many of Brunelle's paintings portray only streets and structures. While discussing this aspect of his work, Brunelle refers to one of his favorite painters, Edward Hopper, who said of his own aesthetic project, "What I wanted to do was paint sunlight on the side of a house." Hopper's "Early Sunday Morning" was the piece that inspired Brunelle to be a painter. 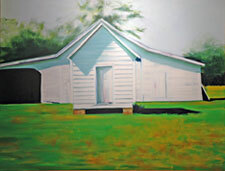 Brunelle's own studies of sunlight on the sides of houses have the same color intensity as his human-centered paintings. He views the buildings from unusual angles -- those of a pedestrian, perhaps, stopped right in the middle of the road. Brunelle describes these paintings as "almost abstract," but they do carry emotional weight. The long shadows and empty streets -- no cars or people -- make the structures look isolated. Despite the manicured lawns and plowed roads, most of Brunelle's towns seem deserted. (See painting by Brunelle on the cover of this issue.) These paintings invite us to take a good, long look. Next time we stop by, the buildings, like the people, might be gone. Brunelle's brilliant acrylics open alongside oils by Pamela Marron, whose arresting landscapes have an entirely different kind of intensity. From a distance, some of Marron's paintings could be mistaken for huge black-and-white photographs. Upon moving closer, however, you start to see blue, purple and green. Marron uses high contrast to create a sense of depth, giving the viewer several rich layers to savor. 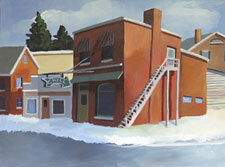 Her paintings -- particularly the snow scenes -- are powerfully still, but they are not tranquil. With the snow in "Winter Shadows," Marron takes full advantage of the subtle range of colors that oil offers. The field of snow covers nearly the whole canvas, but it is the deep stream cutting through the field that catches the eye, and the viewer could spend a long time considering the relationships between the curves of the land and the curves of the water. Marron achieves the same rich intensity with more color in "Amish Barn," which shows a man and a large team of draft horses in silhouette. The painting is unusually long. Marron had the idea for this piece for quite some time, but she couldn't achieve the desired composition on a typical canvas. "When these canvases became available, it seemed like the perfect size for what I had in mind," she says. Like the snow in "Winter Shadows," the expanse of sky and trees in "Amish Barn" sharpens our focus on the dark, slowly moving shadows that are central to the painting. Many of Marron's works contrast sharp architectural lines with natural backgrounds. The white building at the far right of "Amish Barn" -- the only thing that juts into the soft panorama of the tree line -- anchors the farmer and the painting. In the most colorful piece, "Birdhouse in Fall," the diminutive white structure rises out of a gold and purple furze to stand out against the vivid background of three autumn trees. Even in this stunningly vibrant piece, however, Marron's interest is clearly more in the shapes and shadows than in the colors. Similarly, in "White Barn," the lively greens of the grass serve as a foil for the true subject of the painting: blue-gray shadings and deep black spaces. If Brunelle's project is the sunlight on the side of a house, we might characterize Marron's as the shadows in the eaves and doorways. Experiencing these two compelling projects in close proximity could get a little overwhelming -- as though there's been a mix-up in the kitchen and you look down to find both the key lime pie and the chocolate truffle cheesecake in front of you. Impossible to choose. You'd best just pick up your fork and make an evening of it. Pastels and oil paintings by Charles Townshend continue this month, along with metal sculpture by Bill Heise. Gallery owners Greg and Suzy Worden feature art that is unique, but accessible enough for people to enjoy in their homes and businesses. Greg Worden characterizes the work in Gallery 2 as "bits and pieces of landscape worked into a vision that's a little different from what most people see." A portion of the gallery's November proceeds will benefit the Brattleboro Area Drop-In Center. Paula is Gallery Walk's Assistant Editor and a free-lance publicity writer for the arts.